You are here: Home / Build a Career / Do you need a project management degree? 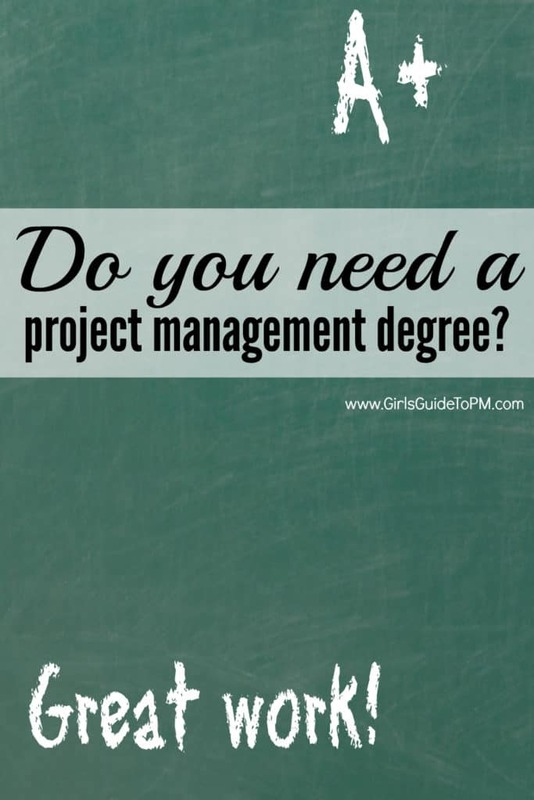 Do you need a project management degree? I have been advised that you have to do a degree in a particular subject e.g. engineering, do project management training e.g. PMI, PRINCE2 etc and work your way up in order to become a project manager. Is this true? On the other hand, I have been advised to do a degree in project management and do work experience in a particular field to build up your experience. 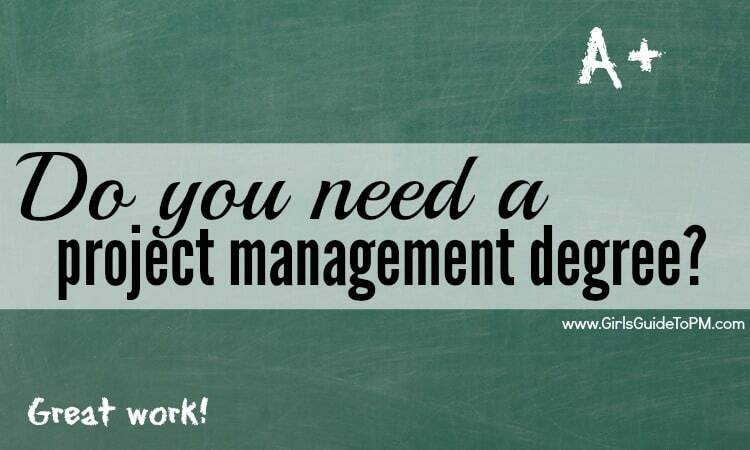 So, do you need a degree in project management to become a project manager? Firstly, I should say that I don’t think you require a degree in a particular subject in order to become a project manager – both my degrees are in English Literature and I work as an IT project manager in the healthcare sector. But you will benefit from a project management qualification such as PMP, CAPM or PRINCE2 in order to get a job as a project manager. Having said that, this might be different if you want to work in a non-office/non-generalist field such as architecture or civil engineering. For all that project management is mainly transferable skills I wouldn’t know where to start with building shopping centres or roads after the years doing what I do. Personally, I think employers value work experience over a degree, so a degree in project management, while it will show that you have the technical and soft skills, will not ensure you a job. What I would do is this: get a degree in a subject I enjoy and could find work in, and then add project management as a specialism later through targeted work experience and certificates. Oh, that’s what I actually did do. Having a degree is a useful back up in case you change your mind later about wanting to work in project management. If you really want a project management degree, there are lots of Masters level courses that offer professionals with experience the ability to codify that through academic and practical study. So if you do want to ‘prove’ your skills, I would suggest doing so at a later date with one of those once you have some work experience to your name. The risk of a undergraduate degree in project management is that you actually find out you don’t much like it after all and then you’re stuck with it. There are other options for building your project management skills without taking a degree. These training courses are good options for improving your skills. Please note that this is my personal opinion and that I cannot give tailored career advice over email. I do have some resources for students here and you can find my views on whether CAPM or PRINCE2 is the right choice for you here. I getting nearer to thirty and have realised I don’t have a proper career path. I have a English literature degree. I have previously worked in retail for seven years and I worked for an airline as cabin crew and in their scheduling department for three years. I’m currently working in the jobecentre. Mentally, I need a new challenge but I’m afraid I don’t have the right skills. I’ll be honest with you, I’ve only just started researching in regards to project management. Based on the experience listed, is there a certain sector you think I would be better suited towards? I just need change so badly, that I don’t even know where to start. What advice can you give me please. Sounds like a job in project management in the travel/hospitality industry would be a good option. There are lots of opportunities in travel companies, tour operators, and the big IT vendors supporting the travel industry. If you enjoyed your time in travel. If not, then I wouldn’t worry too much. Look for a project coordinator or junior PM role in a sector that interests you. P.S. I have a degree in English Lit too! Hi Elizabeth. I’m not sure if this is still active but I am fresh out of high school and have been looking into careers to figure out what I am doing with my life. I was considering project management. However, research has been giving different advice, some advising to go do a degree and others suggesting I skip the degree altogether and do a variety of certifications in pm. What do you suggest I do? Hello Jessica. I don’t know you well enough to give bespoke career advice, but I think the PM apprentice scheme that the UK offers is very good. I’m guessing you aren’t in the UK. This is a really good article about PM certifications here: http://www.colindellis.com/blogpage/your-project-management-certificate-is-worthless. If you can afford to do a degree, there are plenty of reasons to delay making a career choice for another couple of years! I am so happy that I came across your page whilst doing my research for the PM international certificate one year practical course I’m currently busy with. I am totally new to this but already love it. I am now busy with a 7 week online test series which is part of my course and find it very interesting. Your comments inspired me even more to continue with my course until the end and pursue PM even more. Gwen, I’m glad that you’re here! It sounds as if you are very busy with your studies and I wish you all the best with your future career managing projects. I am so happy I subscribe to your email sending because of articles like this. I have about 13 years experience in construction and have worked on small and very big projects and also worked for myself. With that said I have no real qualifications except the introductory certificate to project management from APM I took last year. That is when I got my first real project management position. Most people I know with a degree work in completely different field any way. I would recommend work part time and school part time. Best of both worlds. Best of both worlds has a lot of advantages! Thanks for your comment and I’m glad you are finding the emails useful. Good luck with your exam next week. I’m not sure if this is still an active thread, but I found the comments here useful. I have been searching for an answer to this question, but I have not found a good answer yet. The answers to this question I found basically try to answer the question: will a PM degree help me to get a PM job? (Answer: not really, experience is more important). I’m one of those accidental project managers with a scientific degree who has been promoted into a PM role. I want to know if the process of getting the degree would be useful in my new role as project manager. The superficial answer would be: yes, it can’t hurt. However, it is hugely expensive in time and money costs. So, does it provide me with anything that I can’t get through experience? Do I NEED it? Could I get the information I need from a graduate certificate (i.e. a half-masters type program)? Would an inexpensive 2 week certificate program (basically prep courses for the PMP and Prince2 exams) be sufficient? Could I just read the PMBOK? Hi Jonathan, well, it’s active in that I check every comment and try to reply to them all! Welcome. So, will the process of getting a degree be useful in your new role. You’re right, it can’t hurt. But no, you don’t need it. Your bosses already think you are capable of doing the project management role as you’ve been promoted into that position. Congratulations! It’s a great career move and I hope you’ll enjoy being a PM. In terms of doing a qualification to help you do your new job better, then an inexpensive certificate programme would give you the building blocks of being a good PM. After that, you can decide what you other training you feel is appropriate and there is a lot of it to choose from, including degrees. If you want to start with an even cheaper option, borrow the PRINCE2 manual or the PMBOK from a friend and read them… but be prepared to fall asleep over them. If you do decide to go for a certificate, as you are an accidental project manager you might not yet have the experience to go for PMP, so a CAPM prep course might be more tailored to you. There’s a discussion about the CAPM/PRINCE2 choice here that you might find interesting. Hi Elizabeth, I think this is one of the hottest questions for those who are about to start their journey in project management. And I have to agree with what you said: PMI certification is definitely not a must. As we were making some PM myth busting, we found out that 2/3 of CIOs see the certification as a valuable benefit, not a necessity (http://www.wrike.com/blog/02/12/2014/Top-Five-Project-Management-Myths-Busted-NEW-INFOGRAPHIC). We also see the rise of accidental project management. Overall, I believe that primarily, experience is key. your research shows that CIOs don’t require certification as essential: I think that speaks to the fact that experience is valued in the IT industry. A quick point to ponder: The best project managers out there have not a single degree in project management. Younger generation, though, does not believe in no degrees in anything, and they are all getting certified. I think that’s partly to do with the fact that getting a degree these days is very costly and employers are not paying for them. If you can get ahead in your career without one, and your company won’t invest in a degree for you, it’s a difficult choice to make to invest a lot of cash in a degree that isn’t 100% going to advance your career path. I have a degree in Project Management, and it took 3 years of full time study. I also hold Prince2, MSP, P3O, ISEB PPSO and have been a contributor on PMI’s Portfolio Management Body of Knowledge; I feel fairly qualified to comment from both sides of the fence. The article mentions Project Management being transferable skills, and therefore a degree gives a greater understanding of Project Management than any other qualification, and these skills will be useful in many other occupations. What a degree gives a person is reading many points of view in Project Management, and not one that is aligned to PMI or Prince2. A Project Management degree also teaches in depth techniques in areas such as planning, resourcing, project accounting, risks, value management, problem solving etc, which the other ‘1 week courses’ do not teach; When that person has added relevant experience, they will know when to pull these techniques out of the bag and rely on them in the right situations. I still find many people in their twilight years of their career who struggle, with a lack of the relevant hard project skills. I have also worked with others who have a degree in Project Management and they seem more equipped to handle the many varied situations that Projects throw at you. I think the conclusion is, if you want to become proficient in Project Management, this takes years of experience, but if you want to get there quicker with a stronger foundation, then a degree will help. Ralf, thanks for this balanced reply; it’s useful to see your views from both sides of the argument. I agree that a degree will give you a strong foundation, but from an employer’s perspective I think they will also be looking for experience. As you suggest, this combination gives a very rounded project management skillset. I teach at a college that offers a one-year graduate certificate in project management. We don’t offer co-op opportunities, but require our students to complete an actual Capstone project. Another, nearby college goes the co-op route. Their program is 1.5 years with 6 months spent actually working in a project environment. The idea behind both these programs is to give students new to the discipline a much deeper understanding of project management than a 4-day boot camp and, in the other college’s case, expose them directly to day-to-day project environments. What’s nice about these programs is that they’re not undergraduate degrees – if you don’t like it, the time and cost investment isn’t as great – but neither will you forget everything you’ve learned as soon as you step out the door – there’s some depth there. However, I think you’re right – employers value experience over education. I’ll even go so far to say that employers value the opinions of people they already know and trust over either experience OR education (i.e., their network). So while formal education is never a bad idea, students need to set their expectations accordingly. Doors to employment will not magically fly open as soon as the ink dries on their degree or diploma. That sounds like a good “compromise” for want of a better word. A rounded, well-thought out education, coupled with practical real-world experience. Thanks for adding that suggestion to the mix, Geoff! I completely agree with Elizabeth. I have an IT degree and had a career in “programming/analysis”, then earned my PMP (I’m in the United States). It has been a great help to know what the developers are up against when implementing projects. Also, to qualify for the PMP certification test you must have experience hours, so expertise in ‘somthing other than project management’ is quite helpful. That’s true, and something I hadn’t really considered – being 100% project management, if you know what I mean, doesn’t necessarily give you the real-world work experience to empathise with other team members or to know when they are trying to pull the wool over your eyes! A broad background and experience outside of managing projects is something else that I know employers look for.